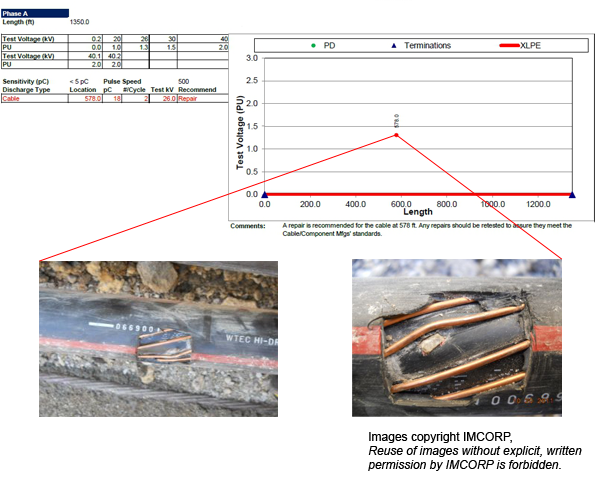 IMCORP’s Factory Grade® assessment discovered a substandard location while commissioning the cable systems at a generation facility. The client used IMCORP’s Location Matching service to pinpoint the defect location. No physical evidence was found upon first glance. Looking at the cable jacket more closely, the field technician noticed a small dimple of dirt that appeared to be pushed into the cable. The installation contractor cut open the jacket and revealed a sharp stone that punctured the jacket and outer semicon layer of the cable (picture above). The stone was a stress enhancement that also created an interfacial void. Mostly likely this damage to the cable insulation would have resulted in a near term failure if left undetected and not repaired.